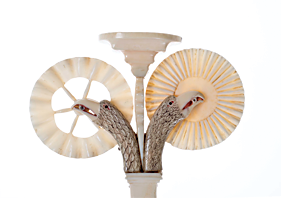 Glass Canes, makers unknown, American and European, ca. 1875–1925. Blown or solid glass, various lengths from 26 to 47 in. 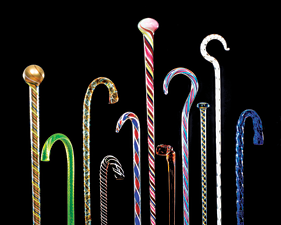 Shelburne’s collection of 167 glass canes is the largest in an American museum. Shelburne Museum in Shelburne, Vermont, is one of North America’s finest, most diverse, and unconventional museums of art, design, and Americana. Over 150,000 works are exhibited in a remarkable setting of thirty-eight exhibition buildings, twenty-five of which are historic and were relocated to the museum’s beautifully landscaped forty-five-acre campus. Shelburne’s collection includes works by the great Impressionists Claude Monet, Edouard Manet, and Edgar Degas, as well as a prized collection of folk art including trade signs, weathervanes, and quilts. Maker unknown, double eagle scrimshaw pie jag (detail), mid-19th century. Carved, incised ivory colored with red wax; brass and silver. H. 7, W. 4, D. 1½ in. Gift of George G. Frelinghuysen. For the first time, Shelburne Museum will remain open year-round with the opening of the new Pizzagalli Center for Art and Education on August 18. The new 18,000-square-foot center includes galleries, an auditorium, and classroom, and will be a cultural hub for the community with events, lectures, music, and changing exhibitions. The museum will celebrate the center’s opening with an inaugural exhibition that pays homage to visionary founder Electra Havemeyer Webb. 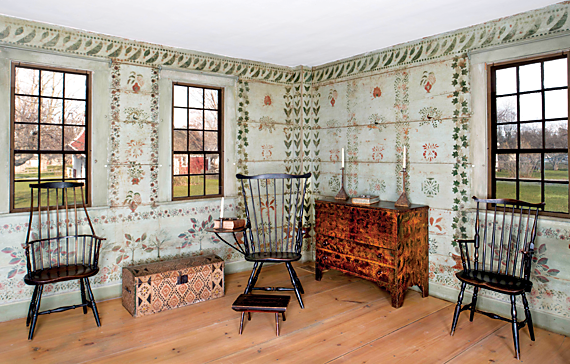 Color, Pattern, Whimsy, Scale: The Best of Shelburne Museum will incorporate the four design themes in its title that characterize the collection and will showcase nearly 100 works including, paintings, folk art, furniture, wallpapers, decorative arts, textiles, costumes, and many other forms, featuring well-known masterpieces and surprising treasures. Harvard Chest, Essex County, Massachusetts, 1700–1725. Pine. Hat and bandboxes (detail), New England, 1825–1850. 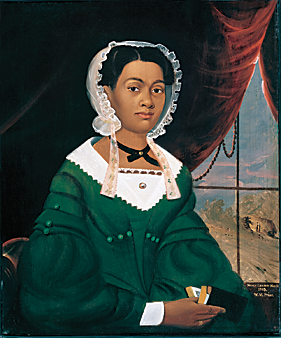 William Matthew Prior (1806–1873), Mrs. Nancy Lawson, 1843. Oil on canvas, 30 x 25 in. Color, Pattern, Whimsy, Scale is on view through December 31. Additional exhibits through October 31, 2013 include Pleissner, Landscape Painter; Something Old, Something New: Continuity and Change in American Furniture and Decorative Arts, 1700–1820; The Art of Peril: Fires, Shipwrecks, and other Disasters; Lock, Stock and Barrel: The Terry Tyler Collection of Vermont Firearm 1790–1900; and Wyeth Vertigo. Contact the museum for information on these and other exhibits. Photography by J. David Bohl and courtesy Shelburne Museum.